← More cancer research. More survivors. No stigma. 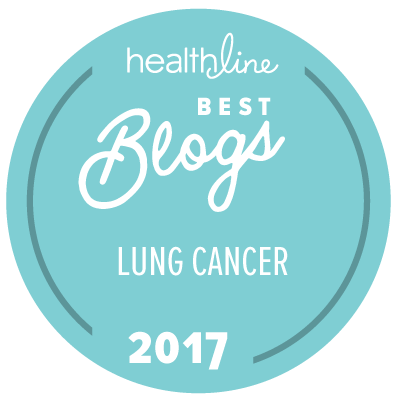 If you have been diagnosed with advanced non-small cell lung cancer (NSCLC), please read this blog post. It could buy you months or years of good living. Lung cancer treatments are advancing so fast that your cancer doctor may not know this information–even if they are at a major academic cancer center. Scientific evidence is accumulating that genomic testing and targeted therapies for cancer patients who have advanced non-small cell lung cancer make a significant difference in outcomes. By “significant difference,” I mean a year or more of survival with good quality of life. Genomic testing and a targeted therapy have given me no evidence of disease for four years despite my metastatic lung cancer. Now THAT’s is a significant difference! Genomic testing looks at the cancer cells DNA for alterations in certain genes that may be driving the cell to act like cancer. FDA-approved drugs are available that can target some of these driver genes (EGFR, ALK, and ROS1) and inhibit the cancer–these drugs are called “targeted therapy.” Targeted therapy for other driver genes are available through clinical trials. These drugs do not cure, but they are usually more effective and more tolerable than chemo. Not every NSCLC cancer will have a driver gene, and not every driver gene has an effective treatment. However, it’s worth investigating, because about 60% of NSCLC adenocarcinoma patients likely DO have a driver gene that can be targeted with an approved or experimental drug (per the LCMC II study). Guidelines from the College of American Pathologists (CAP), the International Association for the Study of Lung Cancer (IASLC), and the Association of Molecular Pathologists (AMP) recommend analyzing either the primary NSCLC cancer tumor or a metastatic tumor for EGFR and ALK, regardless of patient characteristics (such as age, race, or smoking history). The National Comprehensive Cancer Network guidelines for metastatic non-small cell lung cancer strongly recommend testing for alterations in EGFR, ALK, and ROS1 genes, as well a broader genomic panel to look for driver genes that might have clinical trials available. A recent article is a great reference on this subject for both physicians and for patients who want to learn more about their options. It discusses evidence-based molecular testing options, driver genes, and available targeted therapy options, including off-label use of FDA-approved drugs for patients whose cancer mutation does not yet have an approved treatment. It also provides references to professional society guidelines and key journal articles. The authors are Lecia V Sequist, MD, MPH (Associate Professor of Medicine, Harvard Medical School–an EGFR superdocs and a member of LUNGevity’s Scientific Advisory Board) and Joel W Neal, MD, PhD (Assistant Professor of Medicine–Oncology, Stanford University/ Stanford Cancer Institute). Those of you with advanced NSCLC might want to share the article with your cancer doctor. Research and new treatments are moving faster than most cancer physicians can track. Patients with advanced NSCLC can increase their chances of survival if they learn more about their disease. I hope this blog helps you do that. This entry was posted in Advocacy, Clinical Trial, Lung Cancer, Precision Medicine, Research and tagged advanced NSCLC, genomic testing, LCMC II, targeted therapy. Bookmark the permalink.